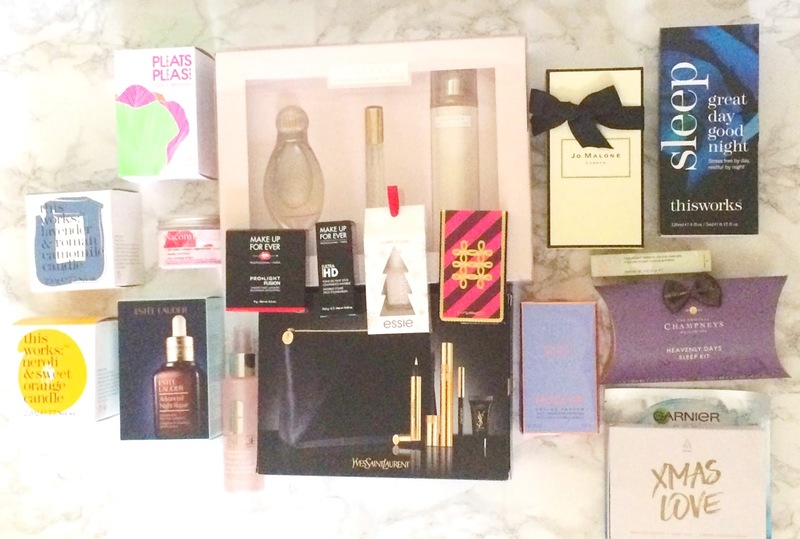 What I got for Christmas 2016 featuring This Works, Jo Malone, YSL & more! Hello, hello! I hope you all had a lovely Christmas! We had a nice balance of both hectic and quiet/cosy times and we're still in the middle of family get-togethers so the festivities are continuing! I received some really lovely Christmas pressies and today, I want to share the beauty bits with you. I'm not bragging at all, I just love to read these posts & hope you will too! I was thrilled to find a bottle of Jo Malone Wood Sage & Sea Salt under the tree because I finished it a few months ago and I have really missed it! I adore the fresh, almost masculine scent and have been dosing myself in it every day! I also received 4 other perfumes: a Sarah Jessica Parker Lovely Gift Set, a Chloe Signature Gift Set Issey Miyake Pleats Please EDT and Thierry Mugler Angel Muse EDP. I was so delighted when I opened YSL Touche Eclat and Luxurious Mascara Christmas Gift Set because I love Touche Eclat but haven't had it for a while and Faux Cils is my all time favourite mascara! Under eye dark circles - be gone!! It also contains a beautiful black makeup bag, a mini liner a sample of Top Secrets Moisturiser. I received two of my favourite Clinique products: Moisture Surge Facial Spray and High Impact Extreme Mascara - another volume-giving mascara! Everybody knows that I love Estée Lauder Advanced Night Repair so it's almost a tradition for me to receive one of their sets for Christmas & this year it's the Estée Lauder Night Time Experts Limited Edition Skincare Set, which contains a 30ml of ANR, a 5ml tub of ANR eye synchronised complex and a 30ml tube of Advanced Night Micro Cleansing Foam. I love the eye serum and I'm looking forward to trying the Cleansing Foam. This Works Great Day Good Night Duo contains my favourite Sleep Plus+ Pillow Spray, which is a staple for me and I recently ran out of so I am really happy to have it back in my life! It also contains a mini sample of Deep Sleep Stress Less, which I've never tried before so I am looking forward to giving that a go! Another sleep/rest inducing set that I received is the Champneys Heavenly Days Sleep Kit, which I have already started to use and love! In my stocking, I received a bottle of Essie Nail Polish in the shade Ballet Slippers - a classic pale pink - the perfect everyday nail colour. I received two highlighters - MAC The Nutcracker Sweet Copper Face Compact and Make Up Forever Pro Light Fusion Highlighter in Golden Pink. The MUFE one has been on my wishlist for quite a while and I also really wanted the MAC one because I mistakenly gave my Whisper of Gilt compact away during one of my clearouts and obviously didn't want to ask for it back so I am happy to have it in my life again! Make Up Forever HD Stick Foundation was also on my wishlist for quite a while and I am really excited to use it because I have only read amazing things about it! I absolutely loved my This Works Neroli & Sweet Orange candle when I was burning it a few months ago so I was delighted to receive a new one because I adore the scent - the combination of orange and neroli is one of my favourites! I'll be burning this when I have my pamper tonight! I also received another This Works candle - Lavender & Roman Camomile - a beautiful scent that will help me to sleep. Nishi, Leanne, Dagmara, Dorota & I all did Secret Santa this year and the lovely Dorota had me! She knows me so well and chose products that I absolutely love! She kindly sent me Alpha H Xmas Love With Love Gift Set, which contains a 50ml Liquid Gold (one of my favourite acid treatments), a 30ml Balancing Cleanser and a 30ml Essential Hydration Cream. I have been waiting to take photos so now that I have, I am looking forward to using these products - especially the moisturiser! She also sent me a Garnier Moisture Bomb Tissue Mask, a Nacomi Raspberry Body Mousse, a Yankee Snowflake Cookie Votive together with some yummy Polish sweets (not pictured because I've already eaten them!) and Christmas chocolate balls. Dorota was so, so generous! I love everything! Check out the links above to see what the other ladies received! I am really delighted with everything I received and very grateful. I also got some yummy chocolate, fluffy socks, pyjamas, clothes, a handbag and a new laptop - I am very lucky! I'd love to hear what you got for Christmas?! Please tell me in the comments below & link to your posts if you blog about them! I hope you all have some lovely plans for New Years Eve! I'm going to enjoy the rest of the festive break with my family and will be back to regular posting on Jan 4th.